Our latest properties in Turkey for sale by owner. All tile floors replaced in 2016 along with 3 refitted bathrooms. All bedrooms have fitted wardrobes. From the salon there is a large terrace providing sun and shade next to the pool. This area has electrical power and ideal for BBQing. Outdoor storage area with ample room for all gardens equipment. The house is being offered for sale fully furnished. The Villa also boasts 2 large first floor balcony terraces off two of the bedrooms with beautiful views of the sea. It's a short walk to Dalyankoy Marina, home to more than 150 yachts of all shapes and sizes. Fresh fish landed daily throughout the year. Dalyankoy also has numerous restaurants, bars, bakeries and local shops. Dolmus and Taxi services available year road to Cesme, Alicati and Ilica towns. Local markets available daily. This stunning house that has been well maintained by the current owner for 12 years and has central heating and air-conditioning. A boar hole supples fresh water to the large swimming pool. Additional there is a 1000lt water storage tank also installed, a garden sprinkler system, outside taps and electric lights around the garden. 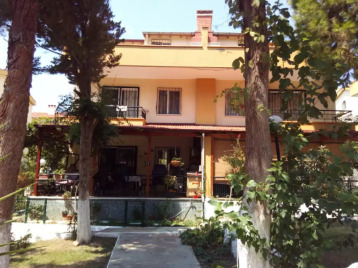 The property is Located 90k from Izmir Adnan Mendres Airport. 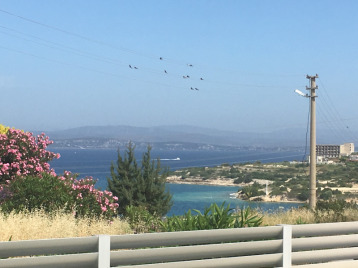 Cesme Town is approx 5 miles and Alacati 7 miles. Close to world famous windsurfing and kite surfing bays.